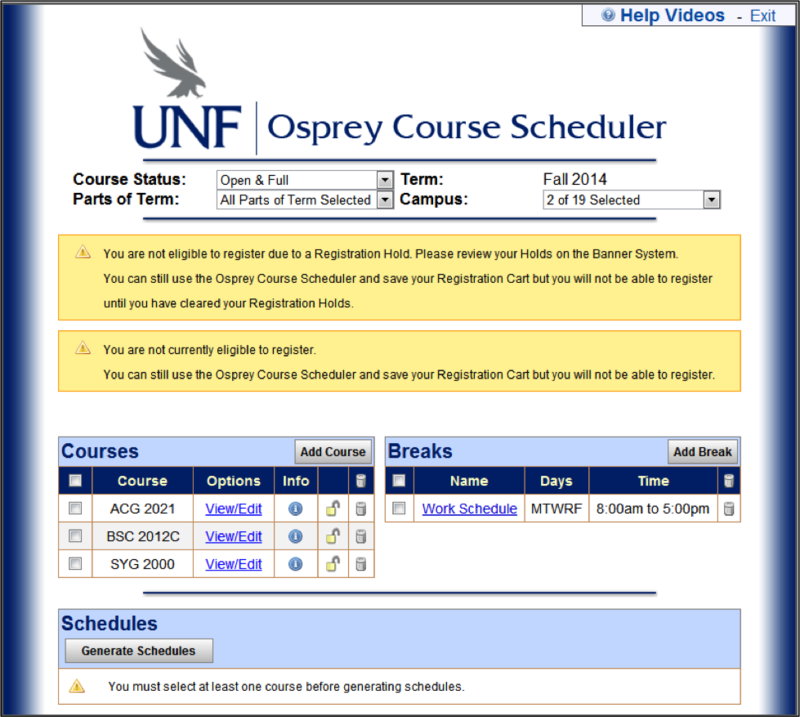 Osprey Course Scheduler – Schedule smarter. Schedule faster. 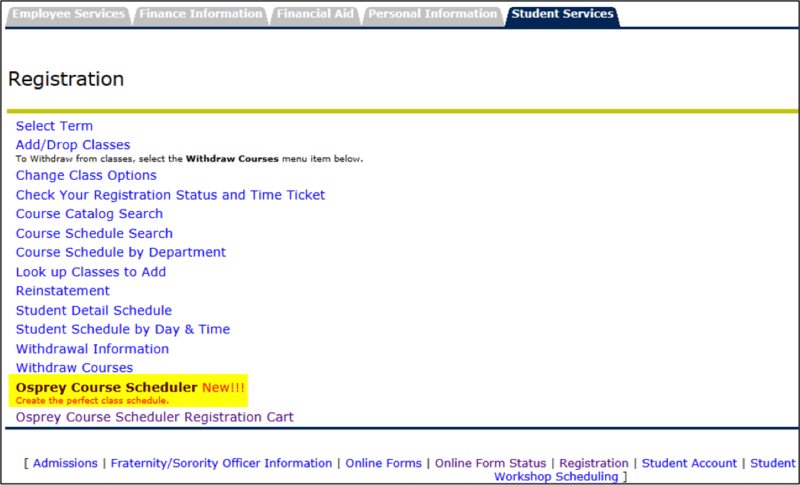 UNF now offers a way for you to schedule your classes smarter and faster! 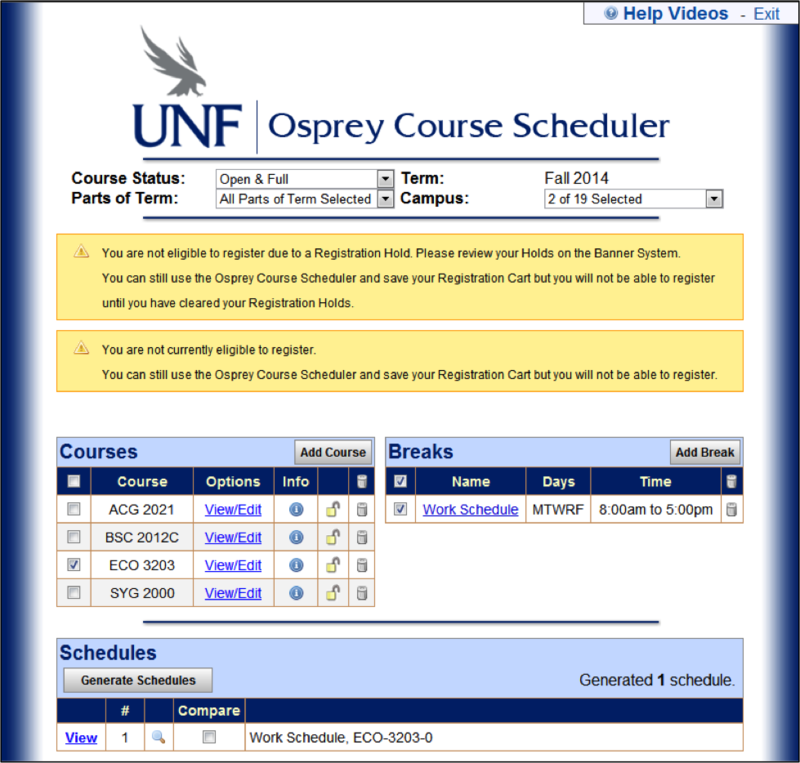 Osprey Course Scheduler, a new registration system accessible through MyWings, allows you to see multiple class schedule options and choose the one that best fits your needs. And it does it all in about 10 minutes – how’s that for convenient? Simply select the campus on which you’d like to take your classes (main, MOCA Jacksonville, one of the local health care centers for an internship, etc. ), choose your courses, and then the sample schedules appear from which you may select. 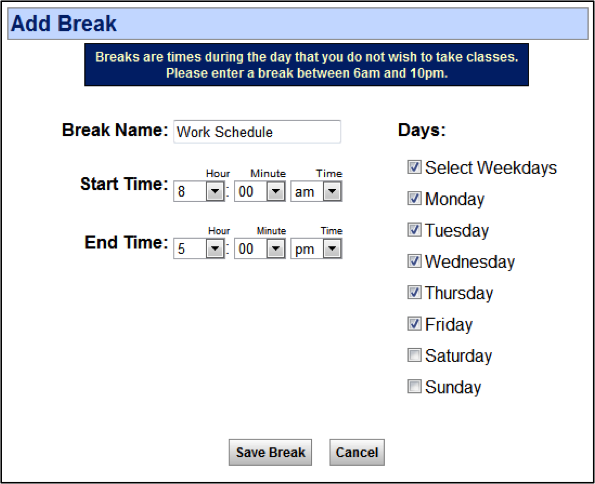 You can even add breaks into your day for work, studying or working out. The software helps eliminate filler classes by better enabling you to search for degree-applicable classes. That means moving toward graduation and your career goals even quicker. You should be automatically re-directed to Osprey Course Scheduler. 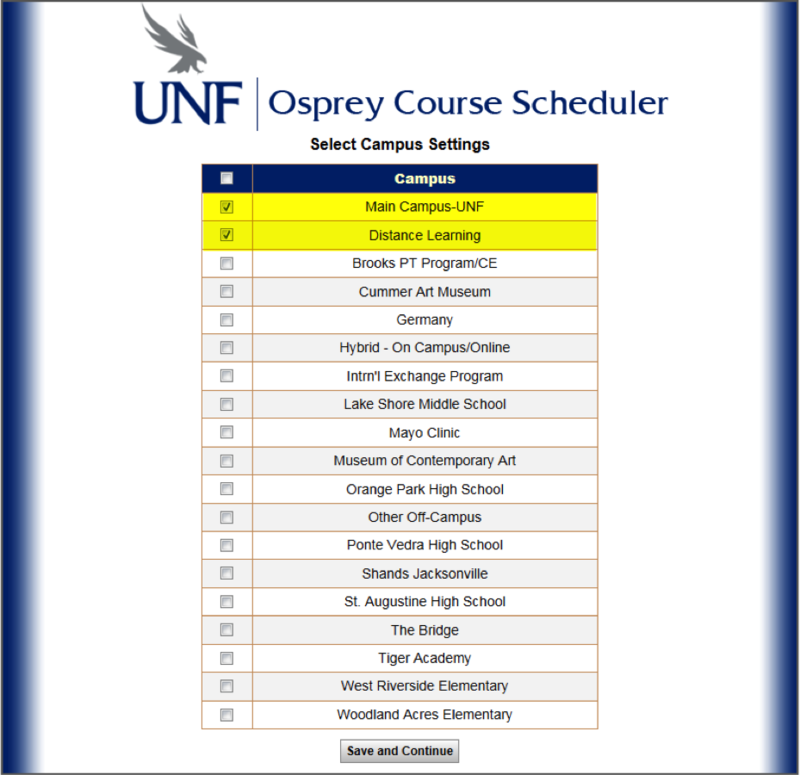 If it’s your first time using Osprey Course Scheduler, check the box to the left of Campus to deselect all campuses before checking the boxes corresponding to the Campus at which you wish to enroll. Save and Continue. 10. Select Add Breaks to build in times when you prefer not to take classes (i.e. 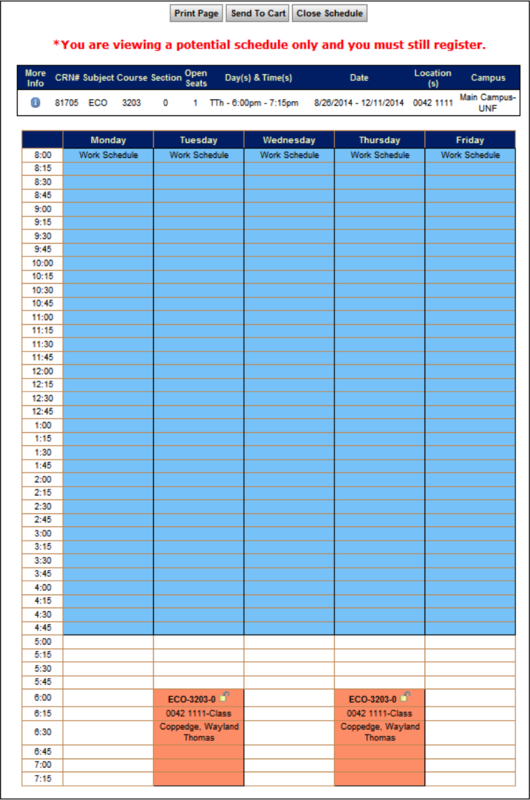 work schedule). The system will save your breaks from term to term. 11. Use the Add Course button to search for classes by subject and course. Tip: Use the lock icon in the Courses section to build the remainder of your schedule around a specific course. 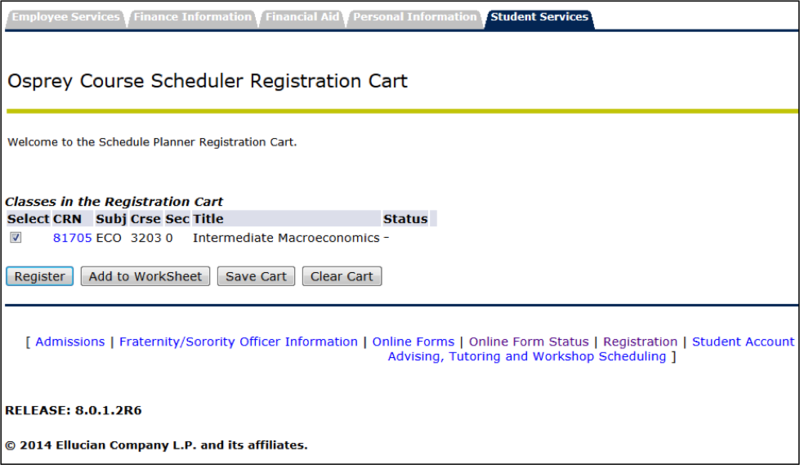 Choose Generate Schedules to see what schedule options are available with your chosen courses. Under the Schedules section, select View to see a detailed schedule. Tip: Use the lock icon on the detailed schedule view to lock your schedule options around that specific section of the course. 12. Once you have a schedule you like, select the Send to Cart button at the top of the schedule view above to transfer your schedule to your myWings portal. A pop-up box will appear that reads, “This schedule will now be transferred to your enrollment shopping cart and the Schedule Planner will close. Do you want to continue?” Select OK.